A lot of the airports in the PilotEdge coverage area are “nontowered” airports, meaning either there is no control tower at that airport, or there are times of the day when the tower is not staffed. This means there is no local air traffic control at those airports, and it qualifies them as “Class G” airspace to the FAA. In Class G airspace no radio communications are required of visual flight rules pilots, but that’s not a smart thing to do because pilots who don’t talk to each other at nontowered airports will probably have a tendency to bump into each other. As a result, nearly all of these airfields have a “CTAF” radio frequency listed on the charts, with the exceptions being some private fields (which use a default frequency of 126.7). CTAF stands for “Common Traffic Advisory Frequency,” and it’s a radio frequency pilots near that airport tune into to report location to each other, especially their location in and near the traffic pattern for departing or landing at that airport. Basically, at nontowered airports pilots self police and exert their own air traffic control by all tuning into and talking to each other on a single VHF chat line. 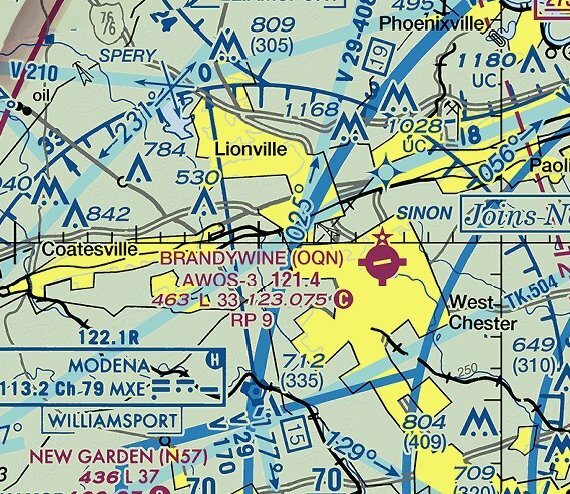 Here’s a section of the VHF sectional for an airport near Philadelphia, Brandywine (KOQN). You can tell it’s a nontowered airport because it’s magenta, that it has a rotating beacon because it has a little star, and that it has services like fuel and maintenance because it has a the spurs of a plus sign on the edges of its circle. You can also see the CTAF frequency listed: 123.075, with the magenta “C” next to it. All pilots flying into, out of, or in the near vicinity of Brandywine should tune to that frequency to report their locations and intentions at least once, and if taking off or landing, their position and intentions at key steps along the way (like turning onto final approach). in Class G airspace,” but I think of it as, “How to make proper CTAF calls.” It’s worth reading and bookmarking if you want to learn these rules of the air.